When I was a kid, hot cocoa was a winter staple. On snow days, my sister and I would brave the elements and build snowmen and pelt each other with snowballs until hypothermia and frostbite were near to setting in. We’d go inside, dripping and strip out of our wet clothes and hop into warm pyjamas and sit down to two steaming mugs of hot chocolate… always of the powdered pouch variety. Winter to me will forever be chapped, freezing limbs and milky chocolate with dried marshmallows bobbing on top. We haven’t had a snow day here in London yet and, to be honest, I don’t really think we’re going to get one this year. When N and I woke up this morning the sun was out and beckoning, so we set out on a nice, two hour walk. Though sunny, it was still cold and I couldn’t help but daydream about something nice and hot to warm us up so I decided to whip up my own hot cocoa. Inspired by Wahaca’s Chilli Chocolate Tequila Toddy, I broke out the cinnamon, cayenne pepper and tequila and what resulted was a thing of beauty. Make this and thank me after your chocolate, tequila induced stupor. Yeah… those mugs are as empty as it gets. 4 tablespoons of quality, unsweetened cocoa powder. I used Hershey’s. First, get your mugs ready. Fill both with boiling (or really hot) water and set aside. It’ll keep your mugs toasty and keep your finished cocoa from going cold too quick! Pour two cups of milk in a saucepan and heat gently. Try not to scorch the milk–it’ll affect the taste and make your pan harder to clean. Once the milk is boiling, drop in your two cinnamon sticks and allow to simmer gently for two minutes. While that’s all happening, combine the cocoa powder, sugar, cayenne, salt and ground cinnamon in a small bowl. When ready, whisk chocolate mixture into the milk a bit at a time. This will help to prevent lumps. After all of the chocolate is in, continue to whisk and bring the cocoa back up to a gentle simmer for another minute or two. 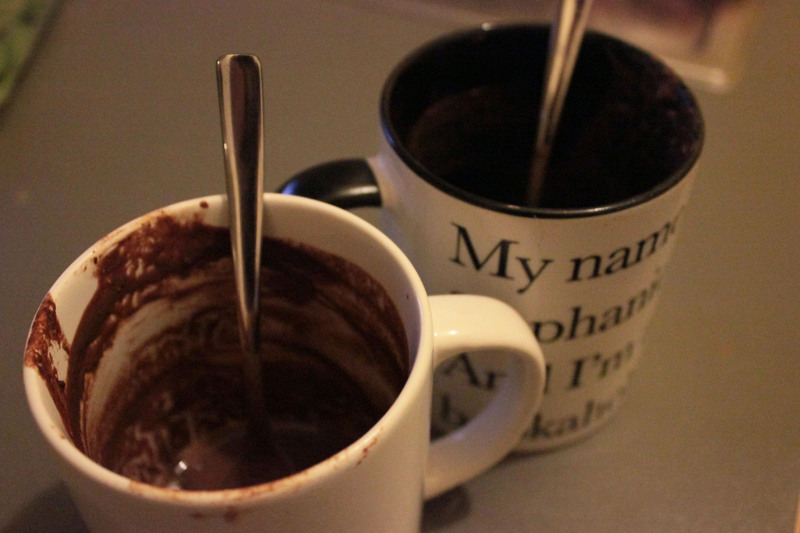 Dump the water out of your mugs and carefully pour in the cocoa. Discard the cinnamon sticks if you would like, but I left mine in. This part’s down to personal preference–some people like their hot chocolate quite thick and others a bit more runny. Splash in as much milk as you would like and give it a stir. Finally, add a tablespoon of tequila into each–or more if you’re so inclined. Rum would also work in place of tequila, as would whisky or bourbon but tequila will fit with your hit of chilli best. Tip: Keep a teaspoon handy for each mug. As the chocolate cools it’ll thicken up a bit. Best to drink this one hot! What are your favourite winter drinks? Get in touch! Tweet me at @stephanie_khani or email me at emailthelondondiaries [at] gmail.com.